I've won a paid three-month internship at Waitrose with their graphic design team. Cairo Hamilton is a final year student on our BA (Hons) Graphic Design course. He was the recipient of a prestigious Royal Society for the Encouragement of Arts, Manufactures and Commerce (RSA) Student Design Award. Here he tells us about the work he submitted for the awards, how he felt when he was announced as a winner, and how his prize will help him kick-start his career. How did you find out about the RSA Student Design Awards? "I found out about them through University, and our tutors advised us to enter as it's a very prestigious competition." Which brief did you choose and why? "I chose 'The Daily Diet', which was sponsored by Waitrose. The brief was to inspire young people to eat more healthily. I chose it because I enjoy engaging with briefs that have the opportunity to create positive social change." Tell us about your work - what was your inspiration? "My research told me that most millennials with unhealthy diets eat this way because they believe eating healthily is costly and time-consuming. So my main focus was to prove that this is not always the case, whilst showing the user how a healthier diet is achievable. 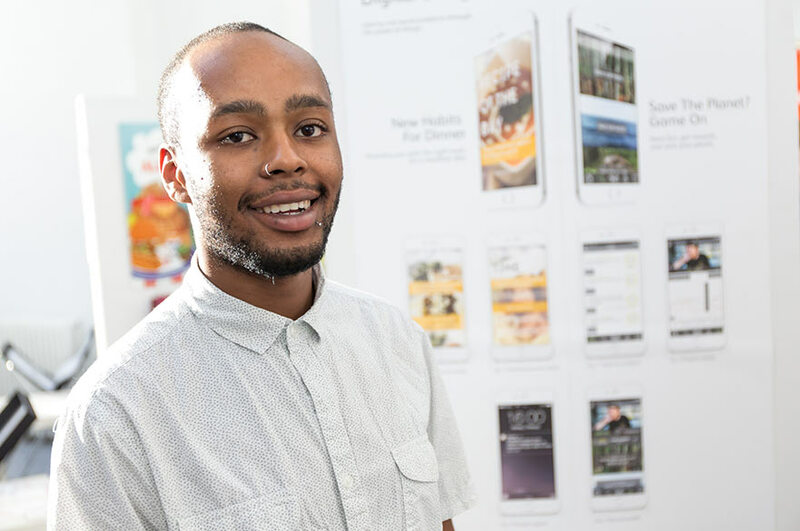 "My project is called '4Dinner' – an app that supports the move to healthy eating. 4Dinner allows the user to improve their diet and cooking skills by inviting them to embark on the '21 Day Challenge'. The challenge is for users to cook and prepare one of the 21 specially curated nutritious recipes every day, in the hope of forming new habits. "Once the new habit has been formed, the app then helps users maintain it by continuing to make it easy to find healthy nutritious meals. Users can search for recipes using time, cost and ease search filters, and 4Dinner will provide relevant recipes based on four ingredients or more." How did you feel when you found out you had been shortlisted? "There were times when I really struggled to say exactly what I wanted to say with this project, so to find out I was shortlisted, and that there was a panel of judges that had not only understood what I was trying to say but liked it too, was a great feeling. "When I found out I had won I was ecstatic, especially considering that I even thought about not entering my project." How valuable do you think this award is in terms of helping you to launch your creative career? "Very – I've won a paid three-month internship at Waitrose with their graphic design team. The RSA Fellowship I've won will also give me the opportunity to make some valuable connections." What would you say are the strengths of NTU's Graphic Design course, in terms of preparing students for industry? "The opportunity to embrace our own interests and pick briefs we enjoy, and to sell ourselves as individuals to industry."